It boggles the mind why so much anime try to prove their maturity by using bleak colors, adult characters and realistic design. Digimon Tamers has none of that. On the surface, it’s a child-friendly battle shounen about kids and their cool pets. A surface is easy to copy, though. Putting things beneath the appearance is harder. 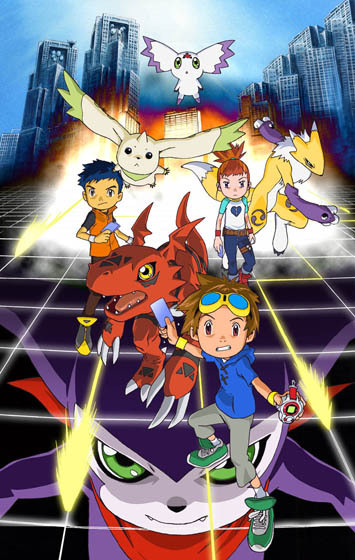 Like Medabots, Digimon Tamers is a subversive, original and challenging work that doesn’t think children are stupid. This is not the dull Adventure, which was just about beating bad guys. Evil is not being fought here. It’s an anime that imbues its adventure with ideas and emotions, rather than just telling us the bad guy is powerful. It constantly raises questions and it stares suicide, depression and death in the face. A truly meaningful and engrossing journey would not consist of only victories. What makes adventures so exciting is because they’re supposed to be a roller coaster of emotions. Tamers uses the adventure not just to have the characters beat up the bad guys by powering up, but by seeing how they cope with breakdowns. In fact, no bad guy is actually being beaten up here. Every character has a clear worldview, and they modify each scene they’re in. It’s not just the main characters who have differing views on what they should do with their Digimon. The brilliance is not even in how they bring to life side-characters like Kenta, Kazu and their parents. The show’s treatment of its so-called antagonists is where it shines. Yamaki is first presented as a stereotypical antagonist. He wears a suit, sunglasses (even when inside) and works in a government agent. He’s out there to destroy the Digimon, but he’s not an attempt to sell DVD’s by hating the government. Yamaki is a real person. He’s a man of control, who loves order and wants to bring it to the world. We don’t get the false dichotomy of joyful chaos and depressive order. The Digimon who bio-emerge into the real world are causing destruction and mayhem. The children may enjoy their cool pets, but the world suffers because of that. Yamaki isn’t an antagonist but a person with a reasonable worldview. He, like any other character, reaches his breaking point. It’s not a complete 180-turn. Since the show knows that humans are only rational with what they got, Yamaki adjusts and improves his worldview. He doesn’t simply switch sides but becomes a better version of himself. Impmon is even better. To have such a character in a kid’s show is brilliant. He’s a perfect example of an Antichrist Superstar. Impmon rejects society, which also rejects him. Yet, he can’t truly exist outside of it. He relies on feedback from people, even if the reaction he wants from them is fright. He wants to subvert and change things. He needs to power to do that, but his power becomes his objective instead of means. Power alone can’t make him feel any better. You don’t fix a car by just having a wrench. So he goes around, demonstrating how powerful it is only to realize he’s leaving worlds destroyed. Society can reject you for being weird, but it will only hate you and actively try to destroy you if you try to harm it. All his power and data he loaded only worsened his troubles. It’s all very impressive, but none of that compares to Jeri’s story. Death, depression and suicide are all connected in a sick cycle. They cause peolpe to question their whole existance. Just read Dylan Kebold’s mother’s essay. How to cope with death, or with your own desire to die is perhaps the greatest philosophical question. The D-Reaper is not just a personification of death. He’s a standing symbol for suicide. His whole program exists to reach the conclusion that death is better than life. It was initially meant to get rid of excess data, but any desire to ‘get rid’ can get out of control when no one’s watching. The D-Reaper distorts every emotion it encounters to turn it into an argument for death. Love is a weakness. It makes us rely on people and we get sad when they go. Hate is terrible. It just makes us want to hurt other people. The problem with suicide and depression is that almost anything can be distorted to fit the conclusion. Some people complain that a friend is sexually attracted to them. Even such a positive thing can be turned into a nail in the coffin. The D-Reaper has no choice, though. He’s a program. Humans, at least according to many are not just programs. We have free will. We can distort every good thing to give us a reason to die, or we can hold on to its beauty. It’s no easy to task. Jeri fights hard, but even she couldn’t do it alone. Tamers doesn’t provide an easy, comfortable answer. Yes, we should look for the good things in life, but we should also help each other to do so. D-Reaper shares common elements with Terminator‘s Skynet. Both are ways for us to look at ourselves, our self-destruction and question it. Like Skynet, D-Reaper is so frightening because he’s logical. It’s not destruction for its own sake but from a coherent philosophy. A villain is only effective if we understand him and recognize that a part of us is in him/her/it. The D-Reaper is not something from outside that comes to wreck our world. It’s a thought many people have. There are things to talk about, like animation, pacing and all that fun stuff. Yet none of that is as interesting as what I’ve just described. It’s better in every aspect than the first Adventure. Even the Digivoltuion sequence aren’t as annoying as before. They’re more dynamic now, coming off like a cool music video. The action is still not much to talk about, yet the only two serious fights are driven by their meaning and not movement. Who cares, though, when you got all that D-Reaper symbolism? It’s worth mentioning that the design of the Reaper and all his agents is also brilliant. They’re similar to Evangelion’s Angels. They look completely alien, but the creators found a different enough style that separates them. Each of the agents’ design is unique and beautiful in a grotesque way. As for the Reaper himself, if I will ever be able to design such a thing my life will be complete. The few flaws, like some episodes dragging feel like nothing. A brilliant show is one that overcomes its flaws. Talking about a dull action scene or an unnecessary episode feels pointless when you could instead discuss the characters, the brilliant design of the Reaper and the meaning underneath it all.